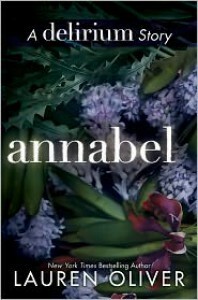 This novella focuses on the life of Lena’s mother, Annabel as she reminisces about her own teenage years and plots her escape from the Crypts.Amazing, how hope lives. Without air or water, with hardly anything at all to nurture it.Oliver’s poetic narrative resonates throughout this novella, and we catch a glimpse into the thoughts and dreams of Annabel, Lena’s mother. I enjoyed the story, and loved the unique perspective of a woman who was ‘cured’ of strong emotions, and yet felt them nonetheless and had to hide them in order to keep the family whom she loved. Very sweet, and gave more insight into how the world became what it was at the beginning of the Delirium series.I do wish it had been longer, and that it had contained more information that wasn’t already gleaned from the other novels. This one could definitely be skipped without missing any of the plot of the series.Overall: Beautiful prose showing yet another side of the Delirium world.